There are a few legends of Kenyan policemen who love their jobs. In the 1990s, there was a famous traffic policeman called Sang who was posted at Langata Road in Nairobi who almost singlehandedly ended the infamous traffic on that busy road. During the last post election crisis a policeman was heard asking some young men why they wanted to destroy the country they had taken years to build almost in an instant. Police Detective Inspector Mollel, the main protagonist in Richard Crompton debut crime novel, is one of these. 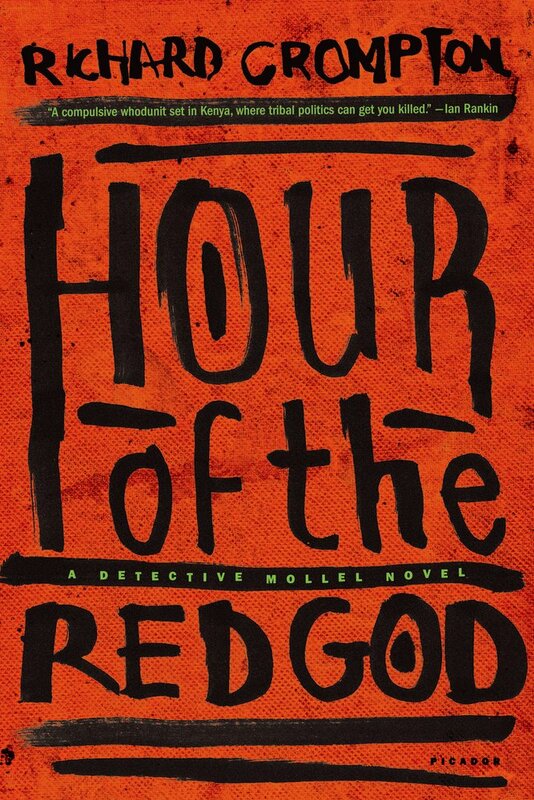 The book published by Picador is called The Honeyguide in Kenya but in the US market is called The Hour of the Red God. We meet Mollel on Saturday 22nd December 2007 just a few days before the election as he is going to buy his son a Christmas present on Biashara Street. As he is on the street, he witnesses a crime, chases and apprehends the petty criminal, and drops him off at the Central Police Station. While there, he encounters the head of CID Otieno who moves him from his current traffic job for a few days to focus on a new case. The case is of a young woman who was killed and it is assumed she was a prostitute; she is a Maasai like Mollei and her body was left at Uhuru Park. Mollei with his new partner Kiunga have to find the killer of the young woman with several challenges facing them. The people involved in the case are important people in Kenya which will always be a major factor where investigating this kind of thing. They include David Kingori a powerful wheeler dealer, preacher George Nalo and his gynaecologist wife Wanjiku, and an old mzungu James Lethebridge. On their side they have Sammy the blind informant, Panya the street boy, Benjamin the former Mungiki man turned church worker and most importantly Honey who was a colleague of the passed on prostitute. The investigation has to be done with the backdrop of the craziest election that Kenya had ever conducted to date with the violence and the rigging that accompanies it. I really enjoyed this book. It’s one of the best pieces of writing that depicts the city of Nairobi I have ever read. The funny part is that it is written by a white guy called Richard Crompton; not exactly the kind of name you would expect writing local based tales. I could quibble about the language translations; it’s not Mavwi but Mavi. No one goes completely kutindi the way he uses it. These language translation issues are minimal and have little bearing on the tale where anyone is concerned least of all this blogger. The character development in this crime thriller is up there with the best writers. Mollei came to the city with his brother to try his luck and joins the police before he turns his back on the Maasai community after being made an elder. Now a single parent to Adam, Mollei is one of those damaged heroes who fails to bond his son as he always recalls his late wife who died in the 1998 US embassy bombings. There was a lot of research done to get this book out and this is a great revelation for me as a resident about Nairobi. We see the twilight girls on K Street, streets that have different eateries used by day and night, a close up look at the Kenyan election process and the underground caves in the town. Heck, I even get to learn that the little lake in Uhuru Park is called Little Mombasa; reading really teaches a lot. The writing is just how I love it, simple functional prose. Every single word is there for a reason and thus I am enjoying as the plot unveils as we all figure that no its this character is the killer, no its this one, no it’s the other one. The plot has some mad mad twists; this Crompton guy can really write. A brilliant book written about Nairobi by a white dude that doesn’t patronize me as a local reader; what’s not to like? Not much. Highly recommended.